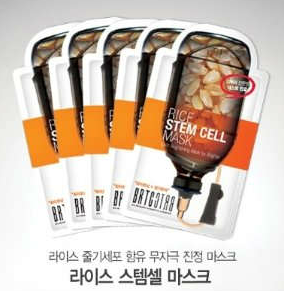 BRTC Rice Stem Cell Mask for skin brightening. This concentrated serum mask is infused with skin-brightening rice callus extract and made of Lyocell fibers with 100% natural, biodegradable and skin-affinitive cellulose. Rice callus extract and other skin-brightening botanical ingredients eliminate skin dullness and even out skin tone for a more translucent and flawless complexion. Selling at Sasa.